When Aunt Joan saw the jewelry I have been making since December, she pulled out her beads and told me to go to town. I still had an abalone shamrock pendant and found in Joan's treasure box two oval pendants. 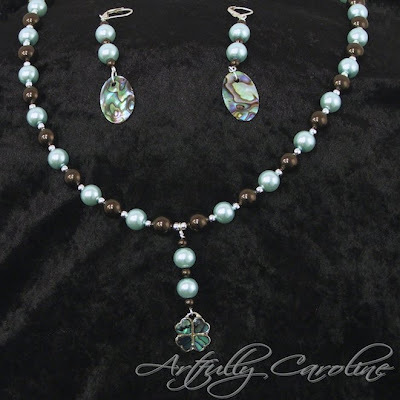 I was able to match up the abalone colors with some pearls from my stash and put together those earring and necklace with it. I love the chocolate brown and aqua together. Very pretty! Love those colors together! Beautiful! I'm really loving this color combination also, very elegant. Thank you for sharing. I would love for you to come link up your post at my "Encouragement is Contagious!" linky party! And... please link up some of your other favorites from blogs you love! Then, those bloggers will also get lots of unexpected, encouraging comments! Very pretty and one of my favorite color combos. what a pretty set! Thanks for sharing this with us.